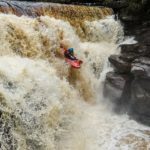 Festival, Kayaking, Lifestyle, River cleanups, Wallace | DBP MAGAZINE ONLINE The World's Best Free Whitewater Publication. DBP Admin Michelle Terrell accepts an award on behalf of us all from American Whitewater and Bluegrass Wildwater Association for our river cleanups. She also covers this year's Lord of the Forks Race and the Russell Fork Rendezvous.